Ekphrasis is a literary description of or commentary on a visual work of art. In poetry – where it is often utilized – ekphrasis is the poet waxing lyrical about a piece of art. In this, we waxed poetic about this amazing sculpture by Danish artist Susanne Ussing. Constructed of the mixed media of newspaper clippings, wood, and metal chimney vents, this large female figure looks like she’s… squashed, and covered in words and images not of her own making. Without discussion, seven female poets went basically the same direction with this… but then trimmed their sails to different winds. This was a worthy challenge. Laura’s observations began literally and then exploded. Andi moved us in blank verse. Tricia started with association and headed toward organized. Sara’s growth spurt produced a mighty tongue, and a big voice. Kelly’s blew me out of the water – and through a glass ceiling. Liz had barely a moment to write this month, but arrived beautifully in her own time, just as in real life. Our lone poetry prince, J.C., will join in with his usual great imagery. Artist Susanne Ussing (1940–1998) was a Danish visual artist and architect who worked in a variety of different mediums from photography and ceramics to large-scale installations and sensory exhibitions. 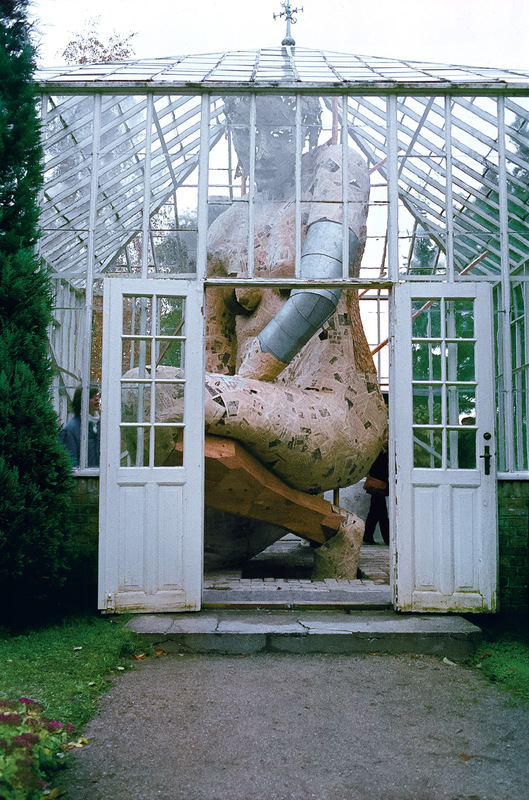 The piece that introduced me to her is the 1980 installation titled I Drivhuset (In the Glasshouse) that was installed at the Ordrupgaard Museum in Copenhagen. Image courtesy of Carsten Hoff. Poetry Friday is hosted today at Katya Czaja’s Write. Sketch. Repeat. blog. Love this. Depending how you read it, there is one, or three, or six, or nine distinct poems. My favorite is “within me/I claim multitudes.” Amen. In your poem I see and feel things I should have the first time I looked at this image. That’s what I love about ekphrastic poems. They make we want to look again and again. I love that you’ve forced open the world of the reader. Like Liz, I am wowed by the titles and how they connect the pieces beautifully. Oh, Tanita. The three parts. The allusions. The titles — I love the titles. This is absolutely beautiful. Thank you. Thanks so much for the background on the artist. Here I was, hoping she might see our response to her work, but…she cannot. As to your lovely poem, I said this before, but I’m intrigued most by the scriptural motif here, and how you play with it and explode it and “force our world open” with your words. Most excellent. Wow, Tanita. The more I read this, the more I get. I love your format; a conversation, with booming voice. I have to keep coming back to it. Bravo!